← Iran : Seismic Activity Continues Three More EQ Ranging From 5.0 to 4.2 Mag On April 20th , 2013. A Total of 16 in six days. Agreements have been signed by 32 countries to allow the highway to cross the continent and also reach to Europe. Some of the countries taking part in the highway project are India, Sri Lanka, Pakistan, China, Japan, South Korea and Bangladesh. Most of the funding comes from the larger, more advanced Asian nations like Japan, India and China as well as international agencies such as the Asian Development Bank. 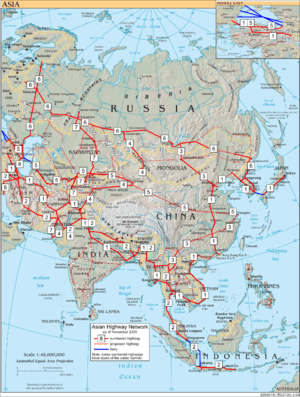 Asian Highway network is a network of 141,000 kilometers of standardized roads and highways crisscrossing 32 Asian countries with linkages to Europe. The project was initiated in 1959 with the aim of promoting the development of international road transport in the region. During the first phase of the project (1960-1970) considerable progress was achieved, but, progress slowed down when financial assistance was suspended in 1975. Entering into the 1980s and 1990s, regional political and economic changes accelerated momentum for the Asian Highway Project. It became one of the three pillars of Asian Land Transport Infrastructure Development (ALTID) project, endorsed by ESCAP Commission at its forty-eight session in 1992, comprising Asian Highway, Trans-Asian Railway and facilitation of land transport projects. A total of US$26 billion has been invested in the improvement and upgrading of the Asian Highway network. However, there is still a shortfall of US$18 billion. UNESCAP secretariat is now working with its member countries to identify financial sources for the development of the network to improve their road transport capacity and efficiency. The Trans Asian Highways Network is now becoming a reality. In most countries the construction and preparation for the network have been completed. In Manipur too, along the Moreh-Imphal-Mao stretch of the National Highway, NH2 we can now see the road signs of Asian Highway, AH1 along the road sides. It was after the Agreements have been signed by 32 countries to allow the highway to cross the continent and also reach to Europe. Some of the countries taking part in the highway project are Japan, China, South Korea, India, Bangladesh, Sri Lanka and Pakistan. It is mostly funded by the larger, more advanced Asian countries like Japan, China and India as well as international agencies such as the Asian Development Bank. _The AH project was first initiated by the United Nations in 1959 with the aim of promoting the development of international road transport in the region. The first phase of the project was carried out from 1960 to 1970 with considerable progress. However, the progress slowed down when financial assistance was suspended in 1975. Later, ESCAP has conducted several projects in cooperation with AH member countries step by step after the endorsement of ALTID in 1992. On the other hand, there were scepticisms from some transportation experts were prominent the mid-2000s about the viability of the project given the economic and political situations in both South and Southeast Asia. Now, the Asian Highway Network is marked with AH1 to AH88. AH1 is the longest route of the Asian Highway Network, running 20,557 km (12,845 miles) from Tokyo, Japan via Korea, China, Southeast Asia, India, Pakistan, Afghanistan and Iran to the border between Turkey and Bulgaria west of Istanbul where it joins end-on with European Route E80. In Japan, the 1200-kilometer (750-mile) stretch was added to the system in November 2003. It runs along the following tolled expressways: Shuto Expressway C1 Inner Circular Route, Edobashi JCT to Tanimachi JCT via Takebashi JCT; Shuto Expressway Route 3 Shibuya Line, Tanimachi JCT to Yoga Exit (Tokyo Interchange); Tomei Expressway, Tokyo Interchange to Komaki; Meishin Expressway, Komaki to Suita via Kyoto; Chugoku Expressway, Suita to Kobe; San`yo Expressway, Kobe to Yamaguchi via Hiroshima; Chugoku Expressway, Yamaguchi to Shimonoseki; Kanmonkyo Bridge, Shimonoseki to Kitakyushu; Kyushu Expressway, Kitakyushu to Fukuoka; Fukuoka Expressway Route 4; Fukuoka Expressway Route 1; From Fukuoka, AH1 takes the Camellia Line ferry to Busan, South Korea. The Japan–Korea Undersea Tunnel has been proposed to provide a fixed crossing. The AH1 stretch in South Korea mainly follows the Gyeongbu Expressway and consists of Chungjangno: Busan Port (Jung-gu, Busan) – Dong-gu, Busan This line is a part of Busan city route 71; Beonyeonno: Dong-gu, Busan – Guseo IC (Geumjeong-gu, Busan) and this line is also known as Busan 1st Urban Expressway and a part of Busan city route 11; Gyeongbu Expressway (Express route 1): Guseo IC (Geumjeong-gu, Busan) – Yangjae IC (Seocho-gu, Seoul); Former Gyeongbu Expressway: Yangjae IC (Seocho-gu, Seoul) – Hannam IC (Gangnam-gu, Seoul); Hannamro: Hannam IC (Gangnam-gu, Seoul) – Hannam Bridge – Yongsan-gu, Seoul This line is a part of Seoul city route 41; Namsan 1st tunnel: Yongsan-gu – Jung-gu; Toegyero: Jung-gu – Seoul Station (Jung-gu); Uijuro: Seoul Station (Jung-gu, Seoul) – Eunpyeong-gu, Seoul This line is a part of Seoul city route 21; Tongilro: Eunpyeong-gu, Seoul – Panmunjeom (Paju, Gyeonggi-do). In North Korea, AH1 stretches over P`anmunjom – Kaesong – P`yongyang – Sinuiju. In China, the AH1 consists of G11:Dandong – Shenyang; G1: Shenyang- Beijing; G4 Beijing – Shijiazhuang – Zhengzhou – Xinyang – Wuhan – Changsha – Guangzhou; G4 Branch from Guangzhou to Shenzhen (adjacent to Hong Kong); G80: Guangzhou – Nanning; G72: Nanning – Youyiguan. In Vietnam, Route 1A: H? Chí Minh City – Biên Hòa – Nha Trang – H?i An – Ðà N?ng – Hu? – Ðông Hà – Ð?ng H?i – Vinh – Hà N?i; Route 22: M?c Bài – H? Chí Minh City; Route 279: Ð?ng Ðang – H?u Ngh? Quan and Route 51: Branch from Biên Hòa to Vung Tàu form the part of AH1. In Cambodia, Route 1: Bavet – Phnom Penh and Route 5: Phnom Penh – Poipet make the AH1. In Thailand, Route 33: Aranyaprathet – Kabin Buri – Hin Kong; Route 1: Hin Kong – Bang Pa In; Route 1: Branch: Bang Pa In – Bangkok; Route 32: – Bang Pa In – Chai Nat; Route 1: Chai Nat – Tak and Route 12: Tak – Mae Sot complete the AH1. In Myanmar, the AH1 draws on National Highway 8 Myawaddy – Payagyi; National Highway 1 Branch from Payagyi to Yangon and National Highway 1 Payagyi – Meiktila – Mandalay – Tamu. In India, the AH1 extends along Moreh – Imphal – Kohima – Dimapur; Dimapur – Nagaon; Nagaon – Numaligarh – Jorabat; Jorabat – Shillong – Dawki; (Branch from Jorabat to Guwahati Petrapole – Barasat; Barasat – Kolkata; Kolkata – Durgapur – Barhi – Kanpur – Agra – New Delhi and New Delhi – Attari. In Bangladesh, N2 Tamabil – Sylhet – Katchpur – Dhaka; N4 Dhaka–Tangail; N405 Tangail–Kamarkhanda; N704 Kamarkhanda–Jessore; N706 Jessore – Benapole make the AH1. In Afghanistan, A01 Jalalabad – Kabul – Kandahar – Delaram – Herat – Islam Qala cover AH1. In Iran, Road 36 : Islam Qala – Taybad; Road 97 : Taybad- Sang Bast; Road 44: Sang Bast – Shahrood – Damghan – Semnan – Tehran; Freeway 2: Tehran – Qazvin – Tabriz and Road 32: Tabriz – Bazargan AH1. In Turkey, AH1 consists of E80 D.100 Gürbulak (Iran border) – Dogubayazit – Askale – Refahiye – Sivas; E88 D.100 Sivas – Ankara; E89 O-4 Ankara – Gerede – Istanbul; E80 O-2 Istanbul – Fatih Sultan Mehmet Bridge; E80 O-3 Istanbul – Edirne; E80 D.100 Edirne – Kapikule; E80 (Bulgaria border) 41°43`5?N 26°21`7.7?E. The route AH1 is also marked as E80 in Turkey. The E80 continues in the E-road network from the border station at Kapitan Andreevo/Kapikule to Sofia in Bulgaria, followed by E80 highways to Niš, Pristina, Dubrovnik, Pescara, Rome, Genoa, Nice, Toulouse, Burgos, Valladolid, Salamanca and finally Lisbon on the Atlantic Ocean. The AH2 is a road in the Asian Highway Network running 13,177 km (8230 miles) from Denpasar, Indonesia to Khosravi, Iran. The AH2 also passes through Manipur. Now, the Trans Asian Highways’ two important roads are passing through Manipur. However, the pertinent questions before the Government of Manipur, its peoples, Civil Society Organisations, the academic and intellectuals are – Are people prepared for the social and economic impacts the Trans Asian Highways may give? Are we prepared to tap the advantages from the two Trans Asian Highways? Are we destined to be just swept away by the Trans Asian Highways? Are we limited to be just bystanders alongside the Trans Asian Highways? This entry was posted in Asia, India, Infrastructure, Roads andHighways. Bookmark the permalink.